View our 2018 season ending October 25 Bass Pro Shops Cruise slide show video on Vimeo: 2018 October 25 Mass Cruisers Bass Pro Shops Cruise Thanks to all who supported our cruises at Patriot Place in 2018 and we hope to see you next April 11 for the start of our 2019 Bass Pro Shops/Cabela’s cruise season again in Foxborough, MA on historic U.S. Route 1..
Here’s the link for the Thursday August 30, 2018 Bass Pro Shops cruise slide show video at Patriot Place. https://vimeo.com/289204716 August 30, 2018 Bass Pro Shops Cruise from John Buchanan on Vimeo. 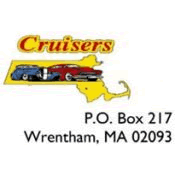 Reminder that this Thursday Sept. 13 cruise is dash plaque night. Dash plaques for the first 1,000 show vehicles.